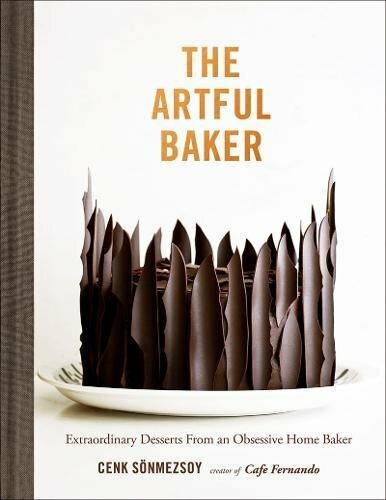 If you're looking for a large baking book that will have you in awe of the stunning food photography, The Artful Baker by Cenk Sönmezsoy is a treat for the eyes, with recipes you'll want to make. By the way, I got this book for participating in the Abrams Dinner Party - they're sending me their complete library of new cookbooks for this season. From the symmetrical fig, thyme and bleu cheese galette, to the chocolate and salted caramel tart on a very whimsical plate, to the messily attractive raspberry jewel pluot galette, to the blanche that looks like a painting, every photo is a gem. A lot of cookbooks that have pretty pictures are filled with recipes that require difficult ingredients, but this one keeps the list reasonable. Or you'll be able to find substitutes. Like those raspberry jewel pluots. If you can't find exactly that variety, it's a good bet you'll be able to find another variety that will work just as well. After wandering back and forth through this book several times, I think the most difficult ingredient would be the fresh chestnuts, but most recipes use ingredients that I could easily pick up at the local grocery store. Well, easily as long as the fruits are in season. But hey, chocolate is always in season, so if you can't find the right apples or the perfect berries, you can just wander back to the chocolate chapter and swoon there for a while. Recipes range from classic brownies and pound cake to more fancy creations like pistachio, quince, and kaymak macarons. If that kaymak sounds foreign, it is. It's a Turkish clotted cream, but the recipe notes that you can substitute mascarpone. See how easy that is? This book isn't all desserts, by the way. There are breads as well. And there are desserts that aren't baked, like the ice creams and other frozen treats. And there are drinks, candies, jams, and jellies as well. This is a big book, with a lot to look at, a lot to ogle, and a lot to make. It would be a lovely gift for anyone you know who likes to bake, or a great addition to your own wish list. This one is definitely a keeper. Yup.